A ground floor rear extension to one of Eric Lyons’ iconic mid-century terraces in Blackheath’s leafy Cator Estate. The house was blighted by a previous rear extension, making access into the garden difficult. Our proposal included the demolition of the conservatory extension to provide an open plan large Kitchen, Dining and Family space open up to the original house, overlooking a terraced garden to the rear. 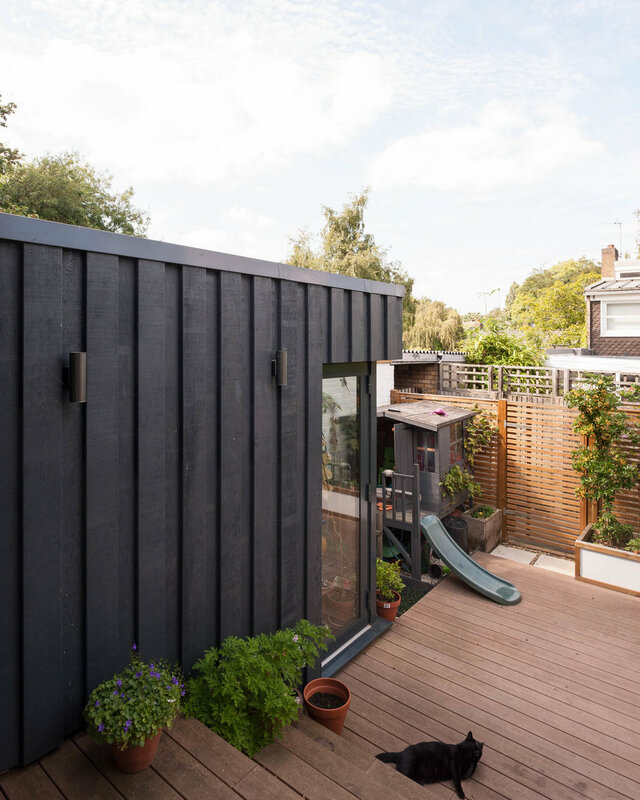 A single storey link extension connects the house with the en-block garage providing a much needed overflow to the kitchen space, separated by steps to the lower level. A large sliding door separates the reconfigured spaces to the rear, from the Lounge area to the front. Dark grey brickwork and black roofing membrane complements the existing house, with a large rooflight and glazed doors flooding the internal space with natural light. The external doors are taken up to the top of the roof line, providing a sense of verticality to the elevations.